AcceleDent again. Cyclic vibration accelerates tooth movement; A clinical trial! Earlier this year I posted about AcceleDent. This was a popular posting and was read 4,000 times. Since then several people suggested to me that I had not been critical enough of this new technology. I took this approach because they had developed a cautious approach to marketing and had not published the results of their trial. However, the results of this trial have now been published and I would like to provide academic viewpoint on this piece of research. I mentioned the web version of this study in my previous post and I felt that it was not a good trial and would be surprised to see it published in a quality journal. I was, therefore very surprised to see this study published in Seminars in Orthodontics; perhaps suggesting that the main scientific journals have rejected this paper. Cyclic loading (vibration) accelerates tooth movement in orthodontic patients: A double blind, randomized controlled trial. This trial was carried out by a team from Texas which has a very good record of research in basic science. OrthoAccel Technolgies Incorporated (OATI) funded the study and Dr Pavlin, the lead author, is a consultant to OATI. This paper was similar to the trial that is included on the AcceleDent website. Nevertheless, there are some differences so I should review this in detail again. The aim of this study was to determine whether vibration produced by the AcceleDent device increased the rate of tooth movement in patients with fixed orthodontic appliances. They randomly allocated 45 patients, aged 12 to 40 years old, to receive treatment with an AcceleDent device or a sham. All patients were maximum anchorage and this was reinforced by the placement of a temporary anchorage device. They carried out a sample size calculation. Random allocation and concealment were good. Orthodontic residents treated the patients. Some of the patients had canines separately retracted, while for some the teeth were retracted en masse.This added to the complexity of the study. They measured space closure directly in the patient’s mouths. They also carried out an analysis of measurement error using a typodont. They analysed the data using an intention-to-treat models and per protocol model and presented the following data. “the effect of vibrations in the AcceleDent group was 48.1% above the baseline value, which demonstrates a significant clinical benefit”. The age range [12-40y] of the patients was very wide with a small sample. They provided little information on the method of measurement of tooth movement apart from that it was directly in the patients mouth using digital calipers. They measured from the canine to the TAD, but it is not clear how they did this. this. I think that more detail is essential. They carried out an analysis of the measurement error on a typodont. This is a poor approximation to the clinical situation. They then only measured correlation and did not provide any information on the average error of the measurement. This is essential for a tooth movement study, where any differences detected may be small. We, therefore, have no idea whether the measurement error was greater than the differences they detected between the groups. I could not understand why this was not reported. They reported that the AcceleDent group tooth movement was 1.16mm/month, this was not very different from the control group tooth movement of 0.93 mm/month used in their sample size calculation. They stated that the difference in the rate of truth movement was 48%. But this was only 0.37 mm/month. 48% of not very much is not very much! Importantly, this is not of clinically significant difference. Make up your own minds on whether the results are being “spun” here. They provided limited information of the statistical analysis that they used and it seems that there were a relatively large number of covariates given the small sample size. The 95% confidence interval of all the measurements was very large and reflected a high degree of uncertainty. For example, from table I under ITT the difference ranged from -0.07 [favors control] to 0.81 mm/month (favours control). But in the abstract they reported this differently. The confidence interval of the difference between the means included zero and this suggests no significant difference. They ignored this when they discussed their findings. This paper was not written according to the CONSORT guidelines. In summary, in my academic opinion this study is significantly flawed in both its execution and reporting. Importantly the conclusions are not really supported by the data. This brings me to another worry; I am concerned that a highly respected journal chose to publish this trial. Seminars in Orthodontics is an excellent publication based around reviews and clinical opinion that a guest editor commissions. It provides a useful information to clinicians. As a result of its overall aims I presume that its papers are lightly reviewed and not subject to the same scrutiny as the AJO-DDO, Angle and EJO etc. Furthermore, the journal does not have a record in publishing original research and the publication of this paper may be a new departure. Nevertheless, it is still very unclear how this paper was approved for publication. I cannot imagine that people who had experience in the complexities of clinical trials passed opinions on whether it should be published. At a very basic level, it appears that Seminars in Orthodontics has commissioned,and published a paper that, in my academic opinion, has obvious and serious methodological issues! I am at a loss to explain this. You may ask why I am so concerned? This is because, currently, journals are a major means of disseminating research. As a result, the editors, guest editors and the boards have a responsibility to ensure the standards of the research that they publish. This is particularly relevant when the trial is funded by organisations that have a financial interest in the findings. For example, at the recent AAO meeting I staff on the AcceleDent stand told me that its use increased the speed of tooth movement by almost 50%. We must also consider our patients, who are currently paying approx $1,000 for an AcceleDent device, with little evidence to underpin its effectiveness. I am, therefore, somewhat disappointed that Seminars has published this paper. I have raised these concerns with the editor and guest editor. If you feel the same as I about this paper and you if would like to express your opinion make a comment in the comments section. If you want to contact Seminars in Orthodontics, details of the editor and editorial board are here http://www.semortho.com/content/edboard. The special issue was edited by Dr Mani Alikhani of New York University . I’m also happy to publish full response on this post from Seminars in Orthodontics and the study team on this blog. Ground Hog day? AcceleDent again! Vibrational force has no effect on tooth movement: A new trial! Your points are very valid. I did not even consider the study design, statistical analysis, etc. in forming the opinion that Acceledent had not proven itself sufficiently for me to offer to my patients; Accelerant cannot help patients wear rubber bands, brush their teeth, or stop breaking brackets through neglect and abuse. These variables must surely affect treatment time as much as actual tooth movement does for a great many patients. I also feel that adding $1000 add ons to the cost of providing treatment will decrease acceptance due to the difficulty in working orthodontic treatment into a typical family budget. Yes, you are correct, the vibration device cannot compensate for the effects of patient co operation and with the lack of evidence I am surprised that orthodontists are promoting this treatment. Dr. Cobourne presented the research in the EOS meeting in Venice last week. It has been published in the JDR. Your critical appraisal is very accurate and has certainly brought to light how a technically faulty piece of scientific research has made it to the forefront of scientific publication. Well to say the least it does bring us around to an old axiom “Is the salesman the king?”. With most scientific research powered and funded by profit oriented corporations where does the line between “high quality treatment perspective changing research” & “marketing myth based dissemination” lie? When research is published in a well known journal, it is perceived by most to be of an appropriate standard: scientific; unbiased; reliable, and trustworthy. We can expect to hear this paper referred to by Acceledent. Thanks to your appraisal of this paper, we are better informed. Although presumably unintentional, autocorrect has humorously changed your phrase in point no. 6 from ‘tooth movement’ to ‘truth movement’. Taking into account the methodology problems in this paper, perhaps ‘truth movement’ is more appropriate! with best wishes, Jan Ledvinka. I felt the same as you about this paper. A lot of bias and confounding factors. It is a shame that an important journal as Seminars in Orthodontics allowed this publication. However, I would like to hear from you, what would you consider clinically relevant as acceleration of movement. I agree that the overall reduction in treatment time is what really matters, more than reduction per month. If we take in account the cost of acceledent and the time lost in use it, I think that 3 months is not enough to be worth. Maybe something close to 6 months (5 to 7 months) could be relevant. I would feel myself comfortable, maybe obligated to refer to my patients. I think this discussion is important to future studies, for appropriated sample size calculation. I have never read about this in studies about tooth movement acceleration. How do you translate a canine on a .018 SS wire in a .022 slot inch slot bracket? Beats me! :)) there is a phenomenon in mechanics called ”flexural rigidity ” of the wire . Need to be careful while making these statements as it can be shown just by putting down some values like: force used (180g) , average length of a canine etc. that theoretically it is impossible to translate a canine. The Guest Editor, Dr. Mani Alikhani has published a number of papers on vibration-assisted tooth movement and one would like to think that this has enhanced the quality of peer-review, or not. The reader can make up his/her own mind. I am most concerned the measurement point of reference was a TAD. Firstly, we all know TAD’s can tip under sheer force vectors, but, does vibration increase the ‘failure rate’ of a supposedly immovable reference point? On another note, I can’t justify selling these units to my patients who are already under financial pressure in difficult economic times and risk pricing myself out of the competition using shoestring evidence at best. Another issue is that proponents of Acceledent claim the mechanism by which it works is via increased activation of osteoclasts. Based on their experimental design I think a good case could be made that the more likely mechanism would be that the vibration may help unbind the wire as it tips and binds during sliding mechanics. This is a significant issue because this gadget is marketed to Invisalign patients as well where sliding mechanics are absent. Based on what I have seen in the published literature I see no reason to believe Acceledent does anything other than possibly help relieve some minor discomfort. However, this relief of discomfort could also be achieved by having the patient chew some sugar-free gum or bite on some kind of soft plastic at a fraction of the cost. I also completely agree with the other criticisms of the Pavlin et al paper you raised, Kevin. Thanks for your pursuit of vetting science from marketing regarding the Accelendent “study”. Orthodontists need to read the fine print regarding claims of studies sponsored by manufacturers, and evidently some Journals that may benefit from manufacturers influence? I agree with your assessment of this study and will offer up another recent study of Ortho Accel-Acceledent done in the UK and written up in the Journal of Dental Research. I know Stohler has even calculated the morphine equivalent of the placebo effect, hence the need for sugar pills in many studies. In the present type of study, however, is there a need for a sham device? Can people think their canines distally? This is a technical point that I’ve been discussing with the young doctors here in the People’s Republic of Ann Arbor. I look to you for the final decision. Dear Lysle, thanks for the comment and greetings too from the Republic of Mancunia! As you know from the blog I felt that there were multiple problems with this study. I feel that there was no need for the sham device as the question was “does AcceleDent increase tooth movement”? 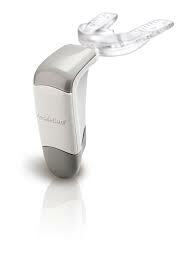 Therefore, the intervention, AcceleDent should be compared to treatment as usual, which should be no device at all. The problem with including a sham acceledent device was that there may be bite plane effect that frees up the occlusion? As a result, they would not be comparing the intervention with normal practice. What do you think? I agree. Imitation without contemplation.